I’ve always envied those who can draw well. Images just seem to flow from whatever medium they choose to create their art with, and the ease with which they can reproduce an image in a total likeness to their subject is often incredible. Some of these artists have had formal training, some have a natural ability, and for others, they have the skill, and have used time and education to hone their talents. Regardless, the art that has been produced as a result of their hard work is often enviable, and well-worth the price that is placed on it. But being an artist isn’t as glamorous as the films would have you believe- indeed, most films show artists as tortured souls and destitute unless they are able to score a gallery showing and sell all of their artwork. As a result, many artists who have decided to turn their talents into a livelihood often have to take on commercial work to pay the bills, working for graphic design corporations and the like until they can make a living solely from their own creations. For some, having had contracts with larger business heavyweights and selling their own work on the side is simply enough, as is the case with Sydney-sider James Gulliver Hancock. Having worked with such big names as Coca-Cola, Ford Motors and the New York Times (just to name a few), Hancock has struck out with his own website, where he sells prints, cards and ceramics that feature his unique designs. He also has several websites which feature his work and where he can be contacted for commissions. Most importantly, however, is the fact that he has released several books, one of which forms the basis of this review. Being an avid traveller, an artist and an architecture aficionado, Hancock has put together some books which feature his illustrations of the well-known (and not so well-known) architecture of major cities around the world. Having covered New York, London and Sydney, he has now turned his attention to the buildings of Melbourne, with his release of the book All The Buildings* In Melbourne *That I’ve Drawn So Far. Claiming to love the city for its grid-like structure and mish-mash of architectural styles, Hancock has travelled around the city and drawn prominent city buildings, as well as lesser-known houses, shops and structures that have caught his interest. With his unique bold outlines and colour palette, Hancock has created an incredible and familiar likeness to many buildings that Melbournians (or visitors to the city) will recognise and love. Each drawing is labelled with the address and the suburb it is located in, and some have extra details added (such as construction dates or other interesting little facts). Among some of the more famous landmarks are images of the Melbourne Zoo, Eureka Tower, Flinders Street Station and the Queen Victoria Market (with some obscure Prahran terrace houses and industrial-looking Fitzroy blocks scattered on the pages between). 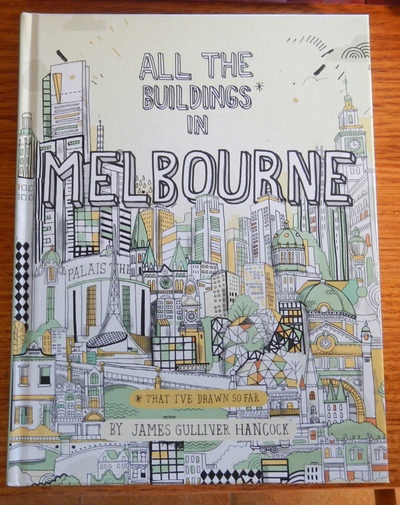 These illustrations are bright and fun, and show the diversity of Melbourne’s architectural landscape, making this the perfect book for a budding artist, architect or lover of the city.